IT’S HAPPENING TODAY! ONLINE EXTRAVAGANZA IS NOW LIVE! 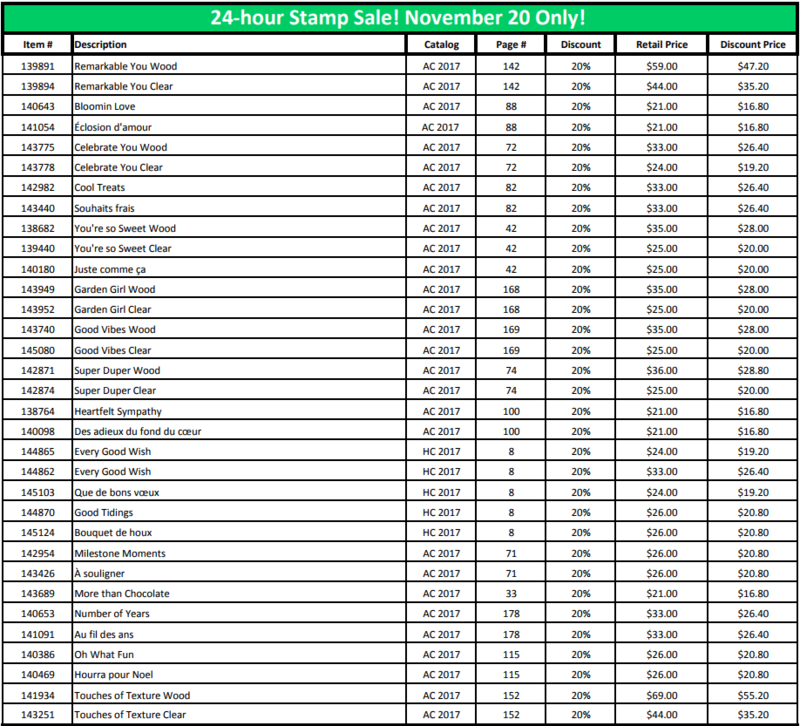 There are a selection of STAMP SETS that are 20% OFF for TODAY ONLY! 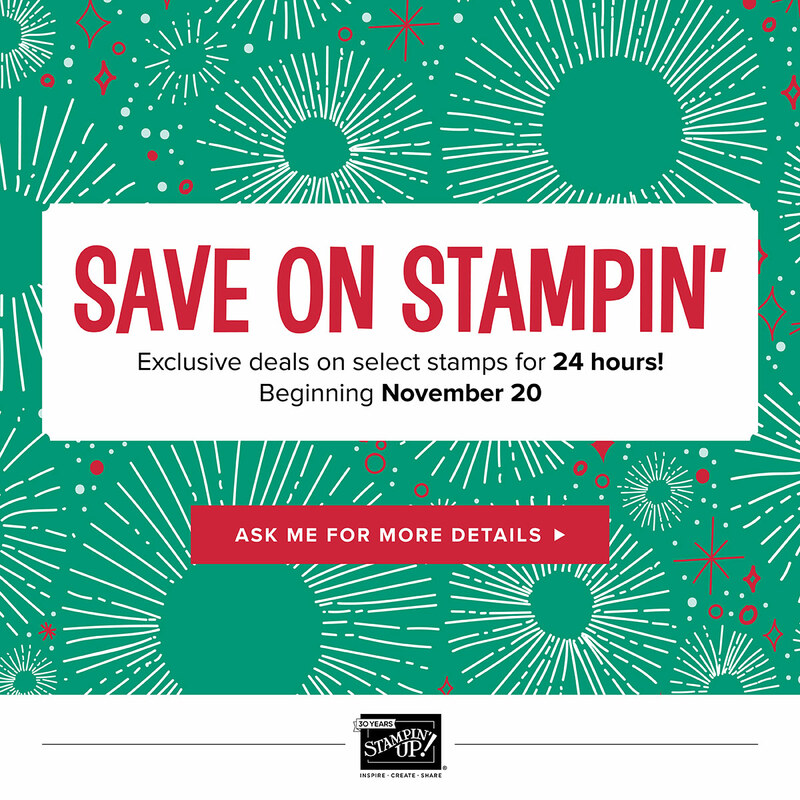 These select stamps are from the Annual and Holiday Catalogues, and you have to get your order in by 10 pm (PST) tonight. Besides the stamp sets, there are many other products, from ribbon, Paper Pumpkin kits, Thinlits/Framelits and more – on sale from today, Monday Nov. 20th through Sunday Nov. 26th. My special offer to you, my Canadian customers, is free shipping on any orders of $50 or more (before tax/shipping)!! As I’m a Canadian demo, I can only offer this deal for my Canadian customers. However – for my U.S. subscribers – my good friend and fellow demo in American, Susan Horr, is matching this deal! For shopping in the U.S., please go to SUSAN STAMPS, to get her Host Code, which must be used for your online orders. For your ONLINE ORDERS IN MY STORE, you must use HOST CODE FXDASWQU when you order. Once I’ve been advised that your order has shipped, I will refund the total shipping amount by e-transfer, directly to you! If you ask me to order on your behalf, I will pay the shipping up front. Click my signature below to go to my online store – it’s open 24/7, but don’t wait!! These items are available WHILE SUPPLIES LAST ONLY! Previous Previous post: FREE SHIPPING DURING EXTRAVAGANZA!